Full time: A great day for the Lions as they smash the Dogs by a whopping and largely unexpected 58 points and they have honoured Fitzroy and the Brisbane Bears in style. Fantastic performance. The Lions have booted 10.1 in the second half, Rockliff has had 40 disposals and bagged two goals, while Brown has yet to get his name on the scoresheet. GOAL DOGSCross grabs a consolation major as he gathers the bouncing ball, steadies from the right pocket and sinks the goal. Margin under 60 points. BEHIND LIONSRaines kicks the Lions' first behind of the second half and increases the margin to 64 points. Contrary to my advice, the Dogs have stopped working in this final quarter and the Lions have absolutely dominated their opponents. They Dogs have lacked confidence and are in trouble. BEHIND DOGSDickson running forward takes the mark 45m out and centres the ball to Cooney who will line up on a slightly closer and on a better angle. Just the one behind. The 'Lions' chant rings around the ground and they are loving every minute of these last moments in the game. 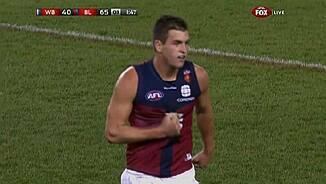 GOAL LIONSHanely swings the kick to McGrath in the right forward pocket and he will line up for number five. He nurses it home beautifully and it's party time now for the Lions! The Dogs have some serious forward concerns as they have struggled to find any targets inside attacking 50 for the entire match and have registered just six goals. BEHIND DOGSThe Lions are happey to concede a rushed behind and they lead by 58 points. 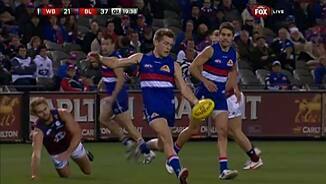 GOAL DOGSHiggins swings on to his right boot and heads for goal, it falls short but Roughead takes the grab. He drop punts through the Dog's first goal since the 22nd minute mark of the 2nd term. GOAL LIONSZorko centres the kick to the danger spot and Bewick flies in from the side to take a ripping grab in the pack. From point-blank range, he pops it home and the margin is 65 points. BEHIND DOGSCooney is held in the marking contest and will line up for a rare shot on goal for the Dogs. From 20m out on a tight angle, he hits it across the face. 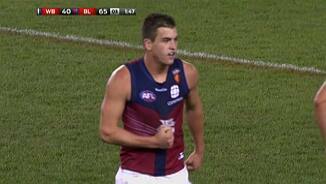 GOAL LIONSBrown sets the kick up to the hot spot and McGrath outbodies Murphy in the contest to take the chest grab. He steers through his fourth goal and the Lions lead by a whopping 10 goals! GOAL LIONSGreen with a spearing pass in to the right forward pocket and he finds Hanley on the impossible angle. He steps inside and this is fast becoming a percentage booster for the Lions! BEHIND DOGSAll clear for a Dogs' behind and they have yet to score a goal since the second quarter. GOAL LIONSRich running through the middle fancies his chances from about 60m, he sizes up the sticks and unwinds with a monster bomb! The flood gates have opened! Lions by 49! GOAL LIONSRedden gathers the loose ball and snaps under pressure and that just might be the killer blow. The Lions lead by 43 points. Ouch. The siren sounds just as Drummond dives to place a wonderful smother on Picken's kick and the Lions are in control of this game and full of confidence, leading by 37 points at 3QT. GOAL LIONSDrummond launches the kick to the top of the goal-square and Rockilff with great body strength takes a fine grab overhead. He make no mistakes and the margin is now 37 points. GOAL LIONSMcGrath with a wonderful pick-up and he shoots the handpass out to Rockilff who steadies and guides the ball through for a lovely goal from 45! Lions out by 31 points! 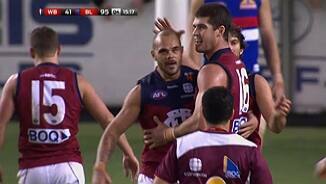 Picken comes off the ground with blood streaming from his nose courtesy of a whack across the face from Black. Maybe the Dogs should try and grubber their kicks inside attacking 50 as they are failing to spot up any targets when they venture forward. BEHIND DOGSThe ball bounces the wrong way for Dahlhaus as he snaps at goal but just misses to the right. The Dogs are under the pump and the Lions are determined to break down their opponents. With five minutes of game time to go in the term, the Dogs need a spark. Something needs to change for the Dogs. They have taken only one contested mark inside forward 50. Jones has been subbed out of the game and on comes Smith for the Doggies. GOAL LIONSBrown takes the strong mark at CHF and then shorts the pass inside 50 to Bewick. He strikes it to perfection and now it's danger time for the Dogs. Lions by 26 points. BEHIND DOGSWood pumps it long from 55 but is off line to the left and they continue to waste chances. GOAL LIONSGolby works the ball forward and leading in to the right forward pocket is Merrett. From 25m out, he drills it through the middle for his fourth goal of the day! Splendid kick! BEHIND DOGSDickson with a super tackle on Rockliff deep in the Dogs' right forward pocket and that's holding the ball. He chips the centered pass to Higgins. Higgins, from 30, wobbles it left. Turned over by the Lions from the kickin and Cooney takes the intercepting grab about 40m out from the sticks. He fails to score. BEHIND DOGSGriffen heads to full forward but the Lions are able to punch it through for a rushed behind. Rockliff has already had 25 disposals along with five marks and is comfortably the leading possession winner on the ground. Back for the third quarter and the Dogs need to pick up from where they left off in those last 10 minutes of the second term. The Dogs finish the quarter with all the momentum but still trail by 17 points at halftime in this fascinating battle. BEHIND DOGSCooney can't capitalise on the Lions' turnover as he swings the shot at goal but he misses too. BEHIND DOGSDickson with an ugly floater on the run and he misses from 45m out. With two minutes to go in the term the Dogs can illafford to concede a late goal here. They trail by 19 points. GOAL DOGSA 50m penalty against the the Lions for a hold on Murphy that apparently stopped him from getting to the next contest and he'll shoot from 50. He thumps it home for a much-needed goal! The Doggie supporters are beginning to get a tad frustrated as the Dogs continue to enter their forward 50 but are struggling to put any score on the board. BEHIND LIONSZorko misses a chance to put the Lions even further ahead as he runs in at goal but drags the shot across the face. The Lions were overrun by the Hawks last week after starting well, but it's fair to say the Dogs aren't as strong as Hawthorn so it'll be a difficult challenge for the Doggies to fight their way back. BEHIND LIONSAnother poster for the Lions as Rich pumps it long from 55m out and hits the woodwork. BEHIND LIONSZorko running down the wing receives the handball from Merrett and drives the kick inside forward 50 where Brown takes a strong grab overhead. He hits the top of the post. GOAL LIONSGreen speeds forward and takes the mark, he plays on, runs inside 50 close to the boundary line and centres the pass to McGrath who has pealed off his opponent. BANG! Lions by 22. 'Goose' Maguire has been subbed out of the game with that injury to his left arm and Green has been activated for the Lions. BEHIND DOGSHoward on the run fires at goal with his non-preferred foot and is just off line. GOAL LIONSHanley delivers to McGrath on the lead and he takes a strong grab directly in front of goal but 50m out. He fires at the sticks from outside the paint and it sails through for a beauty! GOAL DOGSThe ball is kicked inside attacking 50, it spills to Dickson who handballs its back to Giansiracusa who snaps the shot at goal from 35 and drills it for his second! Dogs trail by 11. BEHIND LIONSMcGrath on the lead takes the grab and will fancy his chances from outside the arc on a 45 degree angle. His kick is strong but worked through for a behind. GOAL DOGSGreat start for the Dogs as Higgins receives the handball from Giansiracusa and with barely any time to say 'goal,' he snap it across his body right through the middle! Lions by 16. The second term is underway and the Dogs need to lift their game and workrate to keep up with the pace of the Lions. The Lions are playing some great counterattacking football but the question is whether they can play this style of footy for the full four quarters. They lead by 22 points at quarter time. GOAL LIONSBlack with a superb handball out to Raines who steams in and with five seconds left on the clock he floats through another one for the Lions! Back out to 22 points. GOAL DOGSGriffen snaps the pass back inside from hard up against the boundary line and Dickson dives to take the grab. He must convert. From 25m out on a slight angle, he does just that. GOAL LIONSHanley marks and plays on quickly 50m out from the sticks, he dishes it off to Rich running past on the left and he drives through a great goal from 45m. Lions by 22 points. BEHIND DOGSDahlhaus darts through the centre and pops the kick up in front of Roughead with a fine pass. 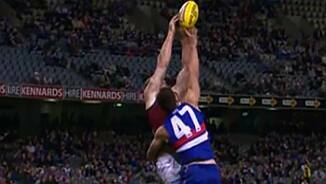 Roughead, from 40m out, clips the woodwork. 3.7 for the year for Roughead. GOAL LIONSPolkinghorne cleverly chips the pass 20m inside 50 to Merrett who will line up on a 60 degree angle in the left forwad pocket. He nurses it home wonderfully for his third! Lions by 17. BEHIND DOGSHolding the ball against Howard - deemed a throw - and Dahlhaus will take the free in the left forward pocket about 30m out. He hooks the shot for a behind. BEHIND LIONSZorko pumps a long ball in to the left forward pocket and Bewick takes the grab overhead. He bananas the shot at goal and misses. GOAL DOGSHiggins swings the kick forward to Giansiracusa at the top of the goal-square and he holds the footy long enough for the mark to be paid. He guides it through for the Dogs' first major. The Lions have started full of running and confidence and their defence is holding up extremely well. The Dogs are under enormous pressure to start this contest. BEHIND DOGSBoyd releases the shot under pressure from 35 and it sails through for a behind. 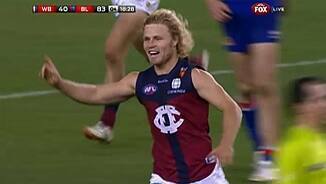 GOAL LIONSBrown drives the kick in to the left forward pocket and Merrett leaps and juggles the grab. He plays on and runs around to reduce the angle and snaps home his second! Lions by 18! Maguire is in pain and is cradling his left arm in his guernseya shoulder injury it looks like and he has come off the field. GOAL LIONSA big collision at the top of the Lions' goal-square as McGrath roves the crumbs, sidesteps an opponent and dribbles through the major! Great start Brisbane! Picken has gone to tag Black early on in the game to stop his creativity and effectiveness around stoppages. GOAL LIONSRedden chips the ball inside attacking 50 in to the left forward pocket and Merrett leads to take the chest mark. He lines up and splits the middle for a great start for the Lions. 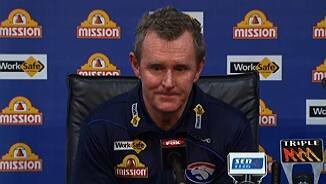 The loss of Minson will hurt the Dogs today but they will still fancy their chances. 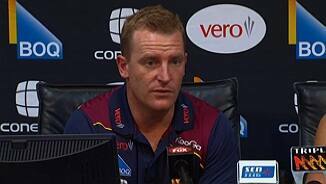 The Lions will be keen to spoil the Dogs' party. This should be intriguing. The ball is bounced and we're away. Welcome to Etihad for the clash between the Dogs and Lions. Both teams line up as selected and the subs are Smith and Green. Ben Hudson will play his first game against his former club today.